Our mini-adventure this weekend was to the Raupp Museum in Buffalo Grove. I get very cagey during the winter, so I am honestly surprised that I did not discover the museum years ago! It is free, close-by, and a reason to get out of the house. All things that I love, especially in the winter! The Raupp Museum is dedicated to acquainting visitors with the history of Buffalo Grove. 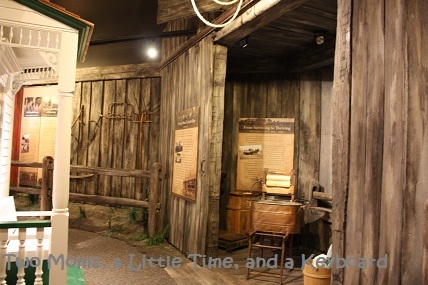 While small, the Raupp Museum is definitely engaging and does an impressive job of depicting history with a child-friendly approach. Honestly, I find that smaller museums that give hands on experiences and little peeks into life often are the most interesting and memorable for younger children. The museum is divided into three galleries. The main gallery portrays Buffalo Grove history beginning with the Potawatomi settlers circa 1830. Scenes throughout history are depicted using artifacts and replicas presented in a manner that is very approachable for children. Children are even invited to open a few drawers to discover hidden treasures including a rotary phone and an old typewriter. What child doesn't love to open drawers! One of the highlights of this room--children can milk a cow replica. Even though my daughter has done this at another museum, she just had to participate in some cow milking for a few minutes! 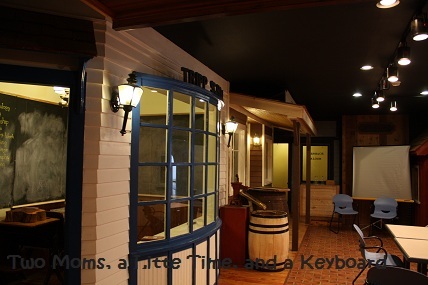 The next gallery houses a life-size replica of a street in Buffalo Grove in the early 1900's. The gallery delivers a sneak peek into common businesses during the time period. Children can see a general store, a pharmacy, a bank, a barber's shop, and a school. 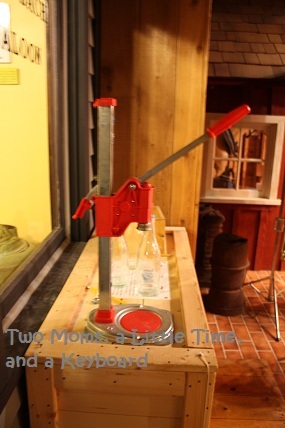 Besides being able to take a little peek into these "buildings," children are also able to try their hand at capping bottles the old school way and pumping water. The museum also sports a third gallery in the basement. The basement houses special exhibits. Unfortunately, the museum is currently in between exhibits, so we were unable to go into the third gallery. Recently, however, this gallery did house a special exhibit on the Civil War. The museum is located at 901 Dunham Lane in Buffalo Grove. Hours are a little sporadic: M-Th 11AM-4:30PM, closed Fri and Sat, Sun 1-4. When we arrived, there was no one there to greet us, which irked me a little because we needed some direction. While entering one of the galleries, someone from an office area shouted to us. It would have been nice for someone to be at the front desk to greet us or for there have been a bell or something to notify someone of our arrival so that we could get an explanation of the museum. I did notice that this happen to other visitors as well. I understand that funding for museums is an issue. However, I would gladly pay an admission price to have someone available to answer questions. Other than that minor blip, I enjoyed the museum and feel that our daughter did have an enriching experience. I also think that the fact that the museum is small was a good thing--I feel like my daughter easily gets bored in larger museums and actually absorbs more in smaller facilities. The Raupp Museum hosts programs through the Buffalo Grove Park District including programs focusing on the Potawatomi, pioneers, and archaeology. From time to time, the museum provides free crafts. In fact, some were provided over the past winter break. If only I had known! Upcoming craft dates include Martin Luther King Day and President's Day from 1:00PM-3:30PM. Additionally, the museum has scavenger hunts. To participate, be on the lookout for clipboards at the front desk. For more information on programs, check with the Buffalo Grove Park District. new follower from the tattle tale blog hop! great site!! Cool...sounds like a cute little museum and nice winter outing. Just a note as someone who's been a volunteer docent for years for a historical museum...the museum is probably a not-for-profit organization and the people working there are most likely volunteers, not paid workers. And in most cases the volunteers at such places are retirees or elderly citizens who need to sit during the duration of their volunteer shift. You could suggest a sign be put at the entrance that directs people to go to the office for assistance. That is a good idea! I will suggest it. There was a front desk but for some reason--maybe a task or something, the docent was always in the office. I was also thinking that maybe they could have a handout explaining the museum at the front desk. That way, visitors wouldn't necessarily need further assistance. I have seen this done at several other museums. I plan on returning in the next couple of weeks so I will talk to the person on staff then. I would just hate for people to leave or miss out on the experience due to confusion! This is really close to me, I'll have to check it out. :) We love all the small museums around.